Our designs are technical in nature. We design showrooms from the point of view of the customers. Our designs are different and elegant. We also provide 3d view to the customers so that the customer get an prior idea how the showroom will look like after being made so that the client can customize his showroom as per his requirements. We also offer complete turn key projects. We offer Modular Sunglasses Showroom Display. Apart from designing the complete showroom we offer display solutions also. In this we suggest you technical placement of displays. We have a wide range of displays such as lockable and non-lockable rods, acrylic wall stands etc. These can be customized as per the requirements of clients. We are into showroom designing for eye wears. We design showrooms in technical way. We take care of each and every aspect of designing. We also see that there is minimum wastage of place. Our all designs are different from each other. We also design as per the requirement of the clients. These can be customized as per the requirements of the clients. We offer Spectacles Showroom Display. Apart from designing the complete showroom we offer display solutions also. In this we suggest you technical placement of displays. We have a wide range of displays such as lockable and non-lockable rods, acrylic wall stands etc. These can be customized as per the requirements of the clients. 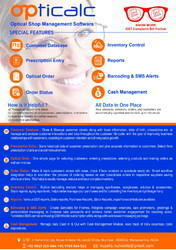 Store & Manage customer details along with basic information, date of birth, prescription etc. to manage and analyze customer interactions and data throughout the customer lifecycle, with the goal of improving business relationships with customers, assisting in customer retention and driving sales growth. Store historical data of customer prescription and give accurate information to customers. Select from prescription charts and avoid manual errors. One simple page for selecting customers, entering prescription, selecting products and making orders as well as invoices. Make & track customers orders with ease, check if lens received or spectacle ready etc. Smart workflow integration helps to smoothen the process of ordering lenses as well consolidate orders to respective suppliers saving efforts and time. This helps to easily manage, reduce and track complex inventory. Built-in barcoding module helps in managing eye-frames, sunglasses, solution & accessories. Stock reports, aging reports etc. helps better manage your purchases and for controlling the inventory and pilferage's if any. Various GST reports, Sales reports, Purchase Reports, Stock Reports, export to excel features available. Create Barcodes for Frames, Integrate campaign creations, sale promotions, greetings & personalized messaging to increase sale prospects and achieve better customer engagement for boosting sales. *Unlimited SMS can be sent using GSM Mobile subscription utility along-with web based messaging package. Manage daily Cash in & Out with Cash Management Module, keep track of daily expenses, bank deposits etc. “Opticalc” Optical Shop Management Software is India's leading software for Optical shop customer management, billing & inventory management. · Purchase Entry : Supplier masters, purchases made from them and their stock etc. Lens management and its inventory for various lens types like Plastic (CR39),Glass, Polycarbonate of various powers like SPH,CYL,AXIS for DV & NV. Contact lens Management & its inventory. Inventory of all types of Optical products such as Frames, Sunglasses, Swimming Glasses, Eyewear for Kids, Lenses, Contact lens, Contact lens solutions, Accessories, Cases. · Barcoding : Barcode printers, Barcode Scanners can be used effectively for purchase as well as sales. Each Product can be barcoded with its Brand, Type, Price, etc. Barcode sticker content is customizable. · Optical Order : Customer Prescription, Order Form, Order Delivery, Order Status. A printed copy of Order form can be issued to the customer along with Prescription on it. · Order Management : Lens Ordering to suppliers by Order number module to track which Lens is bought from which vendor, Sending frames & lenses to fitters, ready to dispatch options available. · Billing : Convert Orders to Bills at the counter with/without Barcode scanners, Retail Bill for customers buying Sunglasses and other products etc. · Petty Cash : Cash flow Management, Debit Note & Credit Note mechanism to handle purchase returns & sales returns respectively. · Stock Reports : Physical stock verification with stocks showing in the software module helps to trace back Pilferages. This important saves huge costs for the opticians by avoiding theft in shop. Also makes staff more accountable & responsible. · Reports : Various types of reports for business intelligence are available. Sales, Purchase, Customers, Suppliers, Aging, Stocks and many more. · Customer Management : Customer history by their Name, Mobile number, Date of Birth, Anniversary Date, Customer code, Previous Deals and Power Prescriptions etc. · SMS Integration : Order Confirmation, Billing, Glasses Ready to Collect, Eye testing Reminders, Promotions, Birthday Wishes, Anniversary Wishes by E-mails, SMS, Letters. · Categories : Classification of Customers, Products, Suppliers under different categories like Contact lens, Single Vision, Bifocal, Progressive & others are possible. · Roles & Rights : Complete Role Based & Rights Based Modules. Security & Backup of data, Multiple User Login, Multiple Computers on LAN, etc. · Backup : Automatic backup facility before closing the software. 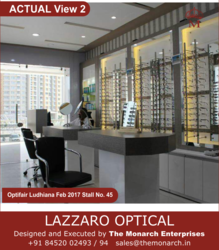 We are into Interior Designing for Optical. We design showrooms in technical way. We take care of each and every aspect of designing. We also see that there is minimum wastage of place. Our all designs are different from each other. We also design as per the requirement of the clients. These can be customized as per the requirements of the clients. 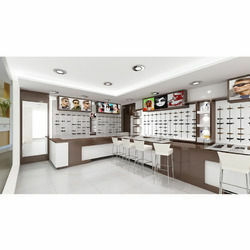 We provide services for Designing Solution for Optical Showroom. Our designs are technical in nature. We design showrooms from the point of view of the customers. Our designs are different and elegant. We also provide 3d view to the customers so that the customer get an prior idea how the showroom will look like after being made so that the client can customize his showroom as per his requirements. We also offer complete turn key projects. We are into showroom designing services for eye wears. We design showrooms in technical way. We take care of each and every aspect of designing. We also see that there is minimum wastage of place. Our all designs are different from each other. We also design as per the requirement of the clients. These can be customized as per the needs of the clients. 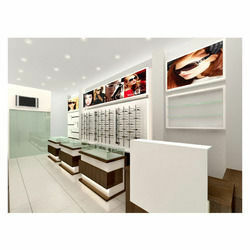 We are into showroom designing services for eye wears. 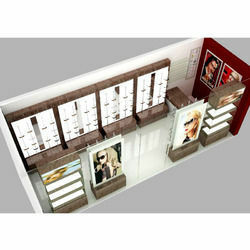 We design Optical showroom display in technical way. We take care of each and every aspect of designing. We also see that there is minimum wastage of place. Our all designs are different from each other. We also design as per the requirement of the clients. These can be customized as per the needs of the clients. Apart from designing the complete showroom we offer display solutions also. In this we suggest you technical placement of displays. We have a wide range of displays such as lockable and non-lockable rods, acrylic wall stands etc. These can be customized as per the requirements of the clients. We are engaged in service providing of Complete Showroom Designing Solution. Our designs are technical in nature. We design showrooms from the point of view of the customers. Our designs are different and elegant. We also provide 3D view to the customers so that the customer get an prior idea how the showroom will look like after being made so that the client can customize his showroom as per his requirements. We also offer complete turn key projects. 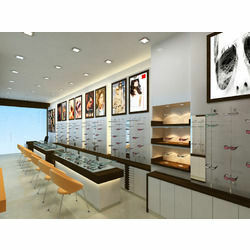 We are engaged in Designing for Optical Showroom. Our designs are technical in nature. We design showrooms from the point of view of the customers. Our designs are different and elegant. We also provide 3D view to the customers so that the customer get an prior idea how the showroom will look like after being made so that the client can customize his showroom as per his requirements. 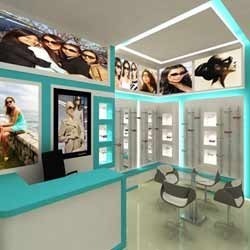 We also undertake turnkey projects for Designing of Optical Showrooms. 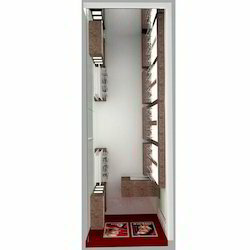 We are into Complete Spectacles Showroom Designing Solution. We design showrooms in technical way. We take care of each and every aspect of designing. We also see that there is minimum wastage of place. Our all designs are different from each other. We also design as per the requirement of the clients. These can be customized as per the requirements of the clients. 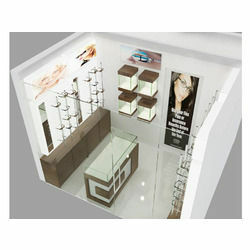 We are into Interior Designing for Eye Wear Showroom. We design showrooms in technical way. We take care of each and every aspect of designing. We also see that there is minimum wastage of place. Our all designs are different from each other. We also design as per the requirement of the clients. These can be customized as per the requirements of the clients. 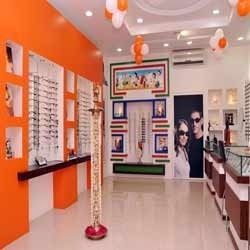 We are into Spectacles Showroom Interior Designing for eye wears. We design showrooms in technical way. We take care of each and every aspect of designing. We also see that there is minimum wastage of place. Our all designs are different from each other. We also design as per the requirement of the clients. These can be customized as per the requirements of the clients. We offer Sunglasses Showroom Display. Our designs are technical in nature. We design showrooms from the point of view of the customers. Our designs are different and elegant. We also provide 3d view to the customers so that the customer get an prior idea how the showroom will look like after being made so that the client can customize his showroom as per his requirements. We also offer complete turn key projects. 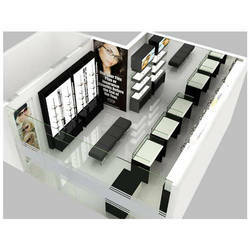 We are into Complete Designing Solution for showroom for eye wears. We design showrooms in technical way. We take care of each and every aspect of designing. We also see that there is minimum wastage of place. Our all designs are different from each other. These can be customized as per the requirements of the clients. We provide services for Interior Designing Solution. Our designs are technical in nature. We design showrooms from the point of view of the customers. Our designs are different and elegant. We also provide 3d view to the customers so that the customer get an prior idea how the showroom will look like after being made so that the client can customize his showroom as per his requirements. We also offer complete turn key projects. We are also provide Turnkey Services for Interior Designing. These can be customized as per the requirements of the clients. We provide services for Complete Eye Wear Designing Solution. Our designs are technical in nature. We design showrooms from the point of view of the customers. Our designs are different and elegant. We also provide 3d view to the customers so that the customer get an prior idea how the showroom will look like after being made so that the client can customize his showroom as per his requirements. We also offer complete turn key projects. 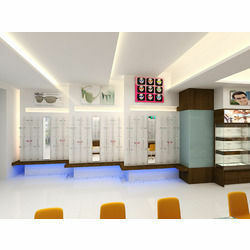 Looking for Optical Showroom Designing Interior with 3D ?